Just wow! What a treasured keepsake. Just lovely. Let Love reign. The greatest of these is love. The symbol of Love, Loyalty, and Friendship is the theme for this exclusive snowflake design, the flagship of our unique themed snowflake series. Six Claddaghs featuring classic Celtic knotwork form a circle around a finely detailed center snowflake design. This highly polished silver over pewter piece measures 2 ¼" across and 2 ½" from top to bottom. Visit our website to see more themed snowflakes from our exclusive collection- each one is sure to become a treasured keepsake. We will make it the way you want it. 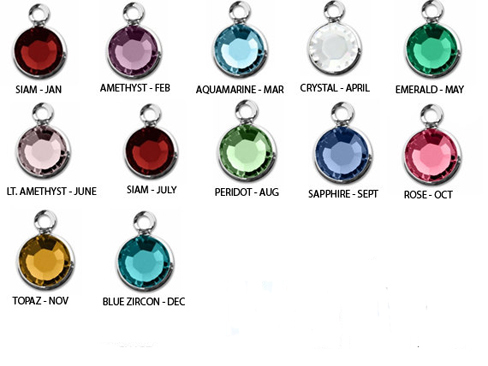 Order your birthstones below and we will add them on for you. If you want them in an order, just leave that information in the notes at check-out! Birthstones are not included. Just showing an example. You may add your birthstones below. -6mm swarovski crystal Birthstones can be added. Just select them and we will add them on!! Put a Note in the checkout of you need them arranged in a special way.